Being in a band is hard. Conflicting personalities oftentimes create drama when you put 3 or 4 people in a small recording room and on the road together. So imagine being in a band with eighteen other people. EIGHTEEN. Now imagine those eighteen people covering artists like Jeff Buckley and Radiohead, with cellos, strings, horns and just about any other orchestral instrument. 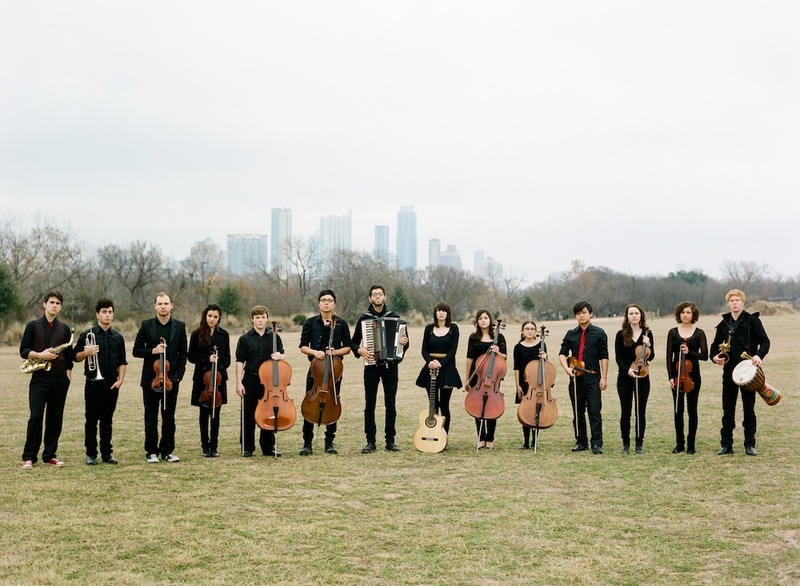 Then imagine those people decide to record a few albums together and you’ve got Mother Falcon, an orchestral indie band (I am pretty sure I’ve never typed those words before) based out of Austin, TX whose latest album “You Knew” is out now. Mother Falcon creates sounds that have been compared to early Arcade Fire – check out the opening track “Pink Stallion” – but whose sound is also nearly impossible to pinpoint. As far as genres go, Mother Falcon spans many, with its inception in orchestral sound thanks to the eighteen members who each play an instrument. But this isn’t your high school orchestra – the music they create is sonically complex; it is also catchy, loose, uplifting, solemn, quiet and loud. To be honest, it’s completely different than anything out there – after all, it’s not everyday that you hear an indie band with cellos. But this is also what makes their sound so refreshing in today’s saturated music landscape. Typically, music sticks because of some sort of unique quality – either in the band’s chemistry or sound. The very existence of Mother Falcon is unique, and that uniqueness spills over into their music. If you are looking for soft, acoustic indie folk, this isn’t quite it (although sometimes, it is). But if you are looking for a wall of sound that can somehow rock but also at the same time be oddly calming, Mother Falcon might fill that niche for you. There is a lot of sound being produced on each of their songs, but some tracks off their latest album, “You Knew,” manage to be calm, despite the abundance of instrumentation. “Porcelain” is quiet and dreamlike thanks to a focus on softer strings and the pixielike lead vocals, while “Marfa” feels like a spring awakening. Others like “Marigold” are more raucous. And some songs, like “Sleep,” are all of these things – an amalgamation of music that at times sounds like a jazzy composition and at times a little bluesy, with horns and piano mixed in for good measure all while lulling you with its orchestral sway. Their music paints a vivid, varied portrait, and it’s not shocking that the band spends some of its time scoring for films and plays.